Amortization is the gradual repayment of a debt over a period of time, such as monthly payments on a mortgage loan or credit card balance. To amortize a loan, your payments must be large enough to pay not only the interest that has accrued but also to reduce the principal you owe. The word amortize itself tells the story, since it means "to bring to death." (1) In mortgages,the gradual payment of a loan,in full,by making regular payments over time of principal and interest so there is a $0 balance at the end of the term. (2) In accounting, refers to the process of spreading expenses out over a period of time rather than taking the entire amount in the period the expense occurred. For example, some real estate closing expenses may be deducted on one's taxes in the current year, but others must be amortized over the life of the mortgage loan and only a small percentage deducted each year. The repayment of principal from scheduled mortgage payments that exceed the interest due. The scheduled payment is the payment the borrower is obliged to make under the note. The scheduled payment less the interest equals amortization. The loan balance declines by the amount of the amortization, plus the amount of any extra payment. If such payment is less than the interest due, the balance rises, which is negative amortization. The Fully Amortizing Payment: The monthly mortgage payment that will pay off the loan at term is called the fully amortizing payment. On an FRM, the fully amortizing payment is calculated at the outset and does not change over the life of the loan. For example, on a FRM for $100,000 at 6% for 30 years, the fully amortizing payment is $599.56. If the borrower makes that payment every month, the balance will be extinguished with the 360th payment. On an ARM, the fully amortizing payment is constant only so long as the interest rate remains unchanged. When the rate changes, the fully amortizing payment also changes. For example, an ARM for $100,000 at 6% for 30 years would have a fully amortizing payment of $599.55 at the outset. But if the rate rose to 7% after five years, the fully amortizing payment would jump to $657.69. Amortization on Standard Loans: Except for simple interest loans, which are discussed below, the accounting for amortized home loans assumes that there are only 12 days in a year, consisting of the first day of each month. The account begins on the first day of the month following the day the loan closes. The borrower pays “per diem interest” for the period between the closing day and the day the record begins. The first monthly payment is due on the first day of the month after that. For example, if a 6% 30-year $100,000 loan closes on March 15, the borrower pays interest at closing for the period March 15-April 1, and the first payment of $599.56 is due May 1. The payment is allocated between interest and reduction in the loan balance. The interest payment is calculated by multiplying 1/12 of the interest rate times the loan balance in the previous month. 1/12 of .06 is .005. The interest due May 1, therefore, is .005 times $100,000 or $500. The remaining $99.56 is used to reduce the balance to $99,900.44. The process repeats each month, but the portion of the payment allocated to interest gradually declines while the portion used to reduce the loan balance gradually rises. On June 1, the interest due is .005 times $99,900.44, or $499.51. The amount available for reducing the balance rises to $100.06. See the chart. While the payment is due on the first day of each month, lenders allow borrowers a “grace period,” which is usually 15 days. A payment received on the 15th is treated exactly in the same way as a payment received on the 1st. A payment received after the 15th, however, is assessed a late charge equal to 4 or 5% of the payment. Amortization Schedule: This is a table that shows the mortgage payment, broken down by interest and amortization and the loan balance. Schedules prepared by lenders will also show tax and insurance payments if made by the lender and the balance of the tax/ insurance escrow account. Readers are encouraged to develop an actual amortization schedule, which will allow them to see exactly how they work. They can do that using one of my calculators. For straight amortization without extra payments, use calculator 8a. To see how amortization is impacted by extra payments, use calculator 2a. Readers who want to maintain a continuing record of their mortgage under their own control can do this by downloading one of two spreadsheets from my Web site. These are “Extra Payments on Monthly Payment Fixed-Rate Mortgages” and “Extra Payments on ARMs.” As the titles indicate, the spreadsheets will allow you to take account of extra payments in addition to regular payments. Payment Rigidity: The payment requirement of the standard mortgage is absolutely rigid. Skip a single payment and you accumulate late charges until you make it up. If you skip May, for example, you make it up with two payments in June plus one late charge, and you record a 30-day delinquency in your credit file. If you can't make it up until July, the price is three payments plus two late charges plus a 60-day delinquency report in your credit file. Falling behind can be a slippery slope. Amortization on a Simple Interest Mortgage: On a simple interest mortgage, interest is calculated daily based on the balance on the day of payment, rather than monthly, as on the standard mortgage. For example, using a rate of 7.25% and a balance of $100,000 on both, the standard mortgage would have an interest payment in month one of .0725 times $100,000 divided by 12, or $604.17. 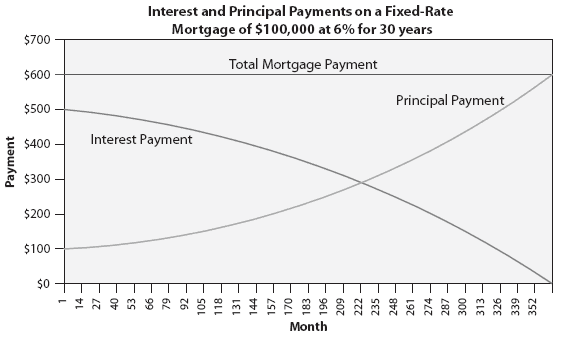 On a simple interest mortgage, the interest payment per day would be .0725 times $100,000 divided by 365 or $19.86. Over 30 days this would amount to $589.89 while over 31 days it would amount to $615.75. rowers who pay late while staying within the usual 15-day grace period provided on the standard mortgage, do better with that mortgage. If they pay on the 10th day of the month, for example, they get 10 days free of interest on the standard mortgage whereas on the simple interest mortgage, interest accumulates over the 10 days. Similarly, borrowers who make extra payments of principal do better with the standard mortgage. For example, if they make an extra payment of $1,000 on the 15th of the month, they pay 15 days of interest on the $1,000 on the simple interest mortgage, which they would save on a standard mortgage. early. If you make your payment 10 days before it is due, you will receive immediate credit with the simple interest mortgage, saving the interest on the portion of the payment that goes to principal reduction for the 10 days. With the standard mortgage, a payment received 10 days early is credited on the due date, just like a payment that is received 10 days late. The deduction of certain capital expenses over a fixed period of time. Amortization generally is claimed on Form 4562. Amortizable expenses include business start-up expenses, qualified forestation or reforestation costs, section 197 expenses (goodwill, going-concern value, covenants not to compete, franchises, trademarks, trade names, and other specified items), intangible drilling costs, mining and exploration expenses, research and experimental expenses, and the cost of getting a lease. Amortizable expenses not claimed on Form 4562 include amortizable bond premiums of an individual taxpayer and points paid on a mortgage if the points cannot be currently deducted. A $500,000 NECB existing loan for a 5 year arm, 15 year balloon, 25 year amortization schedule on a 7 unit mixed-use, 5 story walk-up in New York, NY. 142--renewability, costs and modifications--into account in making amortization decisions. In May, Business Week reported in its Flash Profit survey of 122 companies that profits actually rose 6 percent in part to the "winding down of the practice of goodwill amortization. Now, the cash-rich will have a stronger market position with the freedom to make cash acquisitions, thereby avoiding the excessive EPS dilution, goodwill amortization and additional issues raised by stock deals. Market participants--analysts, brokers, investors--appear to focus on cash earnings disclosures that exclude noncash charges for goodwill amortization. Taxpayers may choose between pool-of-cost capitalization and 48-month amortization, design-by-design capitalization and 60-month amortization, and capitalization. OBRA allows amortization deductions for most intangibles, determined by ratably amortizing an asset's adjusted basis over a 15-year period beginning with the month it was acquired. Analysis of the exposure draft components To analyze the impact of alternative approaches to various provisions contained in the ED, two key elements contributing to expense were isolated and examined: the attribution period and the amortization of the transition obligation. During such an amortization event, finance charge collections normally allocated to the seller will become available to cover trust expenses through a structural feature that fixes the finance charge allocation based upon pre-amortization invested amounts. The loan was originated by ARCS' Calabasas Hills office for a 30 year term/30 year amortization at a rate of 6. This item provides a summary of how to handle one of the most common issues that arise when purchasing or selling bonds--discount and premium amortization.